I’ve been following Toronto’s Real Estate market closely over the last 18 months while applying Macroeconomic concepts to it. It’s been an interesting learning experience to me and I’d like to share my thoughts on the matter here. I’ll preface by saying that the following is just my interpretation of what’s going on. I’ve tried to present as much raw data as I can. I encourage you to make up your own mind, but try to keep an open mind. Ok, so you don’t have to be an economist to understand that something is amiss in the Real Estate markets of Canada’s largest cities, Toronto and Vancouver. I’m going to focus on Toronto in this article. I live there so I understand the dynamics of the city. It’s also the largest city in Canada so what happens here significantly and directly affects the Canadian economy. 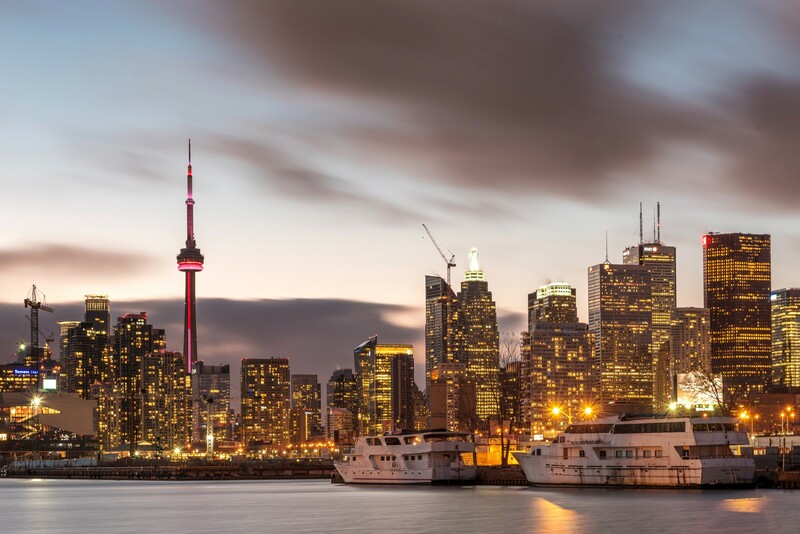 In the last year, home prices in Toronto have surged 33%. The average detached house now costs $1.4M (as of June 2017). This growth has affected condo prices, and prices in smaller suburbs around the GTA. Average home prices in the suburbs are also close to $1M. The median household income was $75K in Toronto in 2014, Let’s assume it is $80K today. Household debt to income levels are now over 160%. This means that a family earning $100K has a debt of $160K. Green line shows monthly new home price index. New homes mean all new homes, not just detached homes. 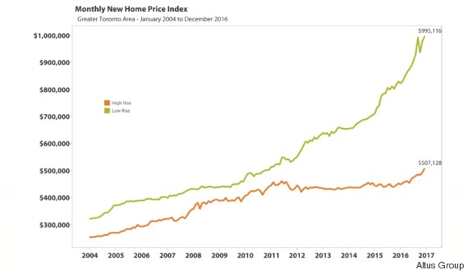 Orange line shows Condo prices. “Ok, so prices are going crazy and people aren’t earning a lot more money than they were before. We already knew that.” Don’t worry, I’ll get to the good stuff soon. Before we start, here are a few simple concepts that you should be aware of. Simply put, The Federal Interest Rate is the cost of borrowing money, as set by the Bank of Canada (BOC). The BOC will regulate interest rates to ensure that inflation stays around 2%. However, changing the interest rate affects the economy in different ways, as we will see below. A low interest rate means people can borrow more money since they will be paying lower interest on their mortgage. Interest rates are often lowered to boost sluggish economies. Low interest rates mean that companies can borrow money cheaply to invest in building goods & services, which in turn will boost the economy. Low interest rates mean reduced foreign investment, because investors do not get a high return on their money. This makes the Canadian dollar less likely to be bought, which lowers the value of it. Therefore, prolonged periods of low interest rates can cause inflation. A HELOC is a mechanism by which a home-owner can take out a loan from the bank. If your house has gone up in value, you can take that equity out of the house at a low interest rate. If you bought a house for $1M (with $200K downpayment), and it has now gone up to $1.5M, you just made $500K on a $200K investment. But you can’t get access to this money until you sell your house. In these situations, you can get a HELOC. The bank would give you $500K (or however much you want, upto 65% of the value of your house), and in return you would pay the bank a low interest rate. HELOCs are often used to consolidate debts since the interest you pay on them is quite low. However, they can be dangerous as we will soon find out. So, what’s actually happening in Toronto? First, let’s talk about what is not happening. I don’t think this market is being fueled by foreign buyers coming and buying up properties in bulk. I don’t trust TREB but their data suggests that only 5% of all property may be bought by foreign buyers. This means foreign buyers bought about 5,000 properties last year in Toronto. That number seems reasonable to me. 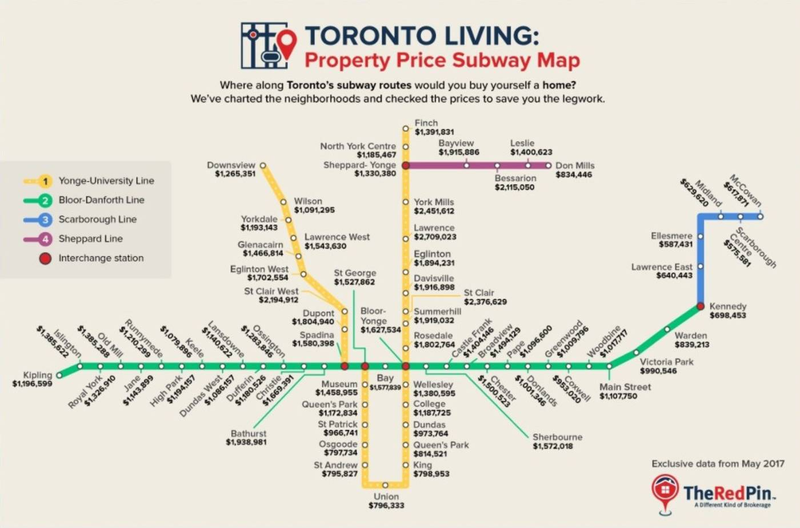 No, prices are not going up because “Toronto is like London, New York and Paris.” Toronto is not one of the financial, cultural, or metropolitan capitals of the world. Not yet. 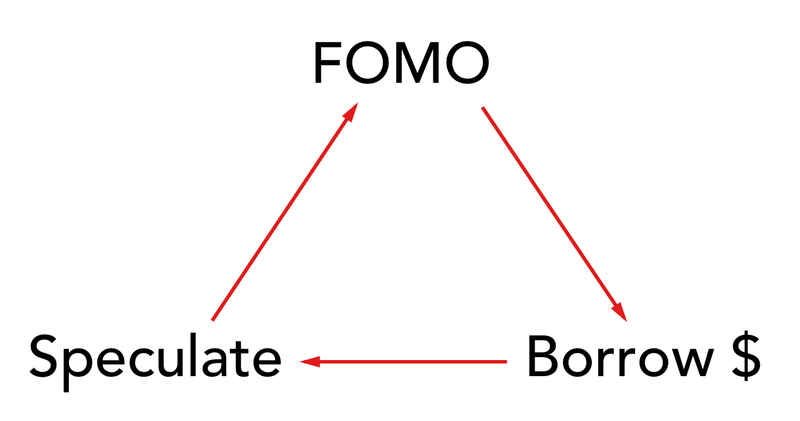 Fear of missing out (FOMO): A situation where an individual feels they will miss out on something if they don’t act now. Cheap credit: Ability for an individual to borrow money and pay low interest on it. Speculation: A situation where an individual takes a high-risk position in an asset because they think it will go up. These three factors directly feed into each other causing a vicious cycle. Let’s demonstrate with an example of a fictional Toronto couple. It’s the year 2015. 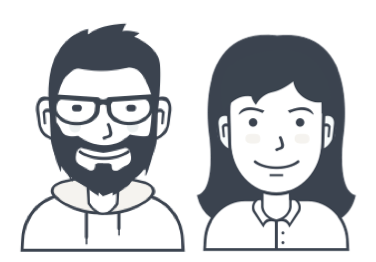 Steve & Kelly are a married couple who rent in Toronto. Let’s say they earn a gross family income of $100K ($6K monthly take-home after tax) and they pay rent of $2,000 a month. Very reasonable. They see home prices going up every year and wonder if their Canadian dream of home-ownership will ever be achieved. They think “well, if we don’t get in now, we won’t be able to afford it later”. Their Real Estate broker tells them the same thing. This is FOMO. They go to their bank to see what mortgage they can be pre-approved for. Guess what? Interest rates are low so the bank says they are approved for a $800K mortgage. This is access to Cheap Credit. 2 years later (2017), Steve & Kelly see that a similar home in their neighborhood just sold for $1.5M. They think, “Wow, it was a great decision to buy this house. We paid $200K out of our own pockets and made $500K in 2 years. We’re rich”. At this point, a few things can happen. And this is where things can get dangerous. Since their house has appreciated a lot, Steve & Kelly decide to take equity out of their house (via a HELOC). They take out $300K, but what do they spend it on? Well, what better investment than your house which has already appreciated 50%? So they spend it on renovating their house with granite countertops, hardwood floors, etc. After all, that increases the price of their home even more, right? Alternatively, Steve & Kelly decide to take a HELOC out to buy another house. Maybe they can take $300K out of this house, buy a condo for $700K, and rent it out. Sounds like a good idea, right? Or maybe what they can do is cash in their profits by selling their house, and use the downpayment to buy a bigger house. After all, everyone wants a bigger house with more bedrooms and a bigger yard. All three of these scenarios demonstrate speculation, as Steve & Kelly really have no idea what the market will do, but they use the increased valuation of their house to live above their means. As home prices keep going up, this vicious circle keeps repeating. People end up living above their means because of the paper valuation of their home. All of this is really happening. 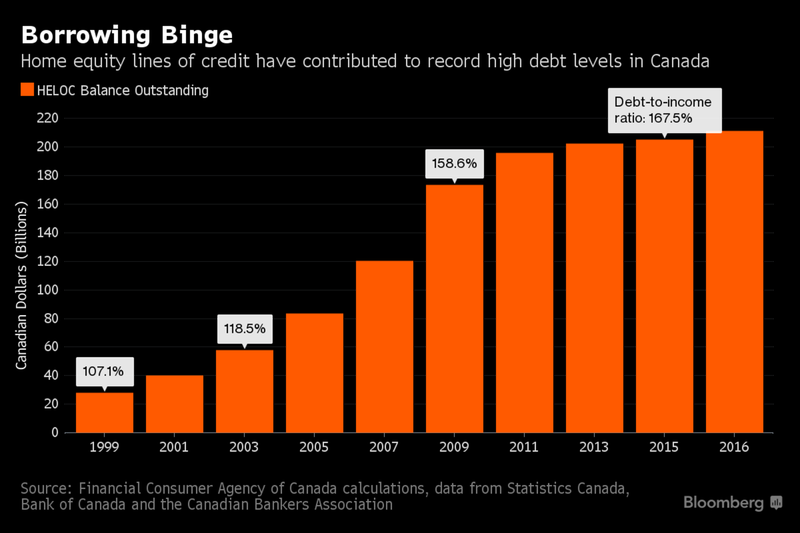 The Bank of Canada recently mentioned that HELOC loans are going through the roof. Forty percent of consumers do not make a regular payment against the outstanding HELOC principal and 25 percent cover only the interest or minimum payment. These loans that people are taking out are being spent on speculative investments or consumer goods. This means things like home improvements, cars, vacations, TVs, Macbooks, etc. What happens next to Steve & Kelly? In the previous example, Steve & Kelly earned $100K/year but somehow managed to get into a $1.5M house + other assets via their HELOC. Well, in the near future, a few things can happen. Well, Steve & Kelly are paying $3,000 at a 2.3% interest rate, which constitutes 50% of their monthly income. They also have to pay off their HELOC at some interest rate. What happens if that rate rises by 1%? Well, their payments would increase by $500, or 15% a month. If rates rose by 2%, they would be paying $1,000 more per month! Now you may say, “C’mon, interest rates don’t rise by 1–2% out of nowhere”, and you’d be right. But it doesn’t actually take a rate hike for Steve & Kelly to get screwed. What happens if property prices stop going up by 15% a year (maybe because the government introduces some measures)? Well, as soon as property prices stagnate, speculators in the market will want to cash out because they were in it to make money. This can cause an increase in supply in the market, which can lower demand. 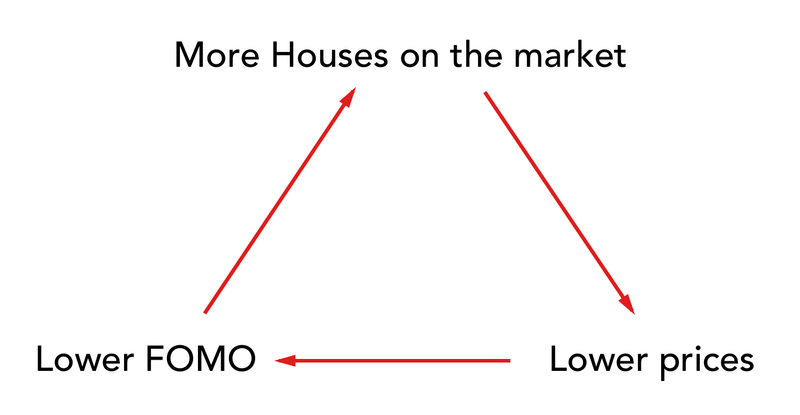 No more FOMO if there are a ton of houses on the market. This causes prices to drop more. No one wants to buy a house when home prices are falling, and everyone wants to sell. Falling home prices will directly affect the amount of remaining equity in Steve & Kelly’s home. What happens if prices fall by 15%, which is possible since they have been rising by 17% YoY? Well, their $1.5M house would be worth $1.22M. Therefore, their total equity is $200K (downpayment) + $220K (appreciation). But they took out a $300K HELOC so their real equity is only $120K. In other words, a 15% decrease in home prices means they are $80K underwater. Ok, but what’s likely to happen? The government is going to try it’s best to make sure people’s home prices do not fall because if they do, they will get voted out. However, the government can only do so much to control the market. They can’t really restrict free market economics. Here’s another data point for you. The Canadian Dollar is trading at the lowest price vs. the USD over the last 12 years, and the Bank of Canada recently announced that the economy did better than expected in terms of job creation. A good economy means that interest rates can rise, because there is no need to support it with artificially low rates (It’s what we talked about right at the beginning, remember?). If rates do not rise, then the dollar will keep falling in value. Raise the rates and let people who have been greedy and speculative in this market take a hit, and cool the real estate market. Don’t raise rates, keep them low, but watch everything we buy at the grocery store slowly get more expensive. Either way, people aren’t going to be happy. And that’s the problem that the Bank of Canada faces. Live within your means. If you are just buying a house because you want it to be your dream home for the next 10+ years of your life, you have nothing to fear. Stop taking on debt. They will have to be repaid, often when you can least afford to do so. If you have already taken on debt, use it on investments, not on speculation. (No, your house is not an investment). Don’t use HELOCs for consumer spending: HELOCs may be good to consolidate debt (such as credit card debt), but don’t use it to buy things which are not direct investments. I think that’s good advice regardless of whether there is a housing bubble or not. If you enjoyed this article, I’d appreciate it if you shared it with your friends. Follow me on Twitter or subscribe to Medium to stay updated on other articles.